BASE class for generators of random ChBody shapes. Set the callback function to execute at each each particle generation. 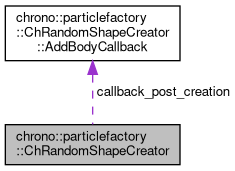 Function that creates a random ChBody particle each time it is called. Note: it MUST BE IMPLEMENTED by children classes! 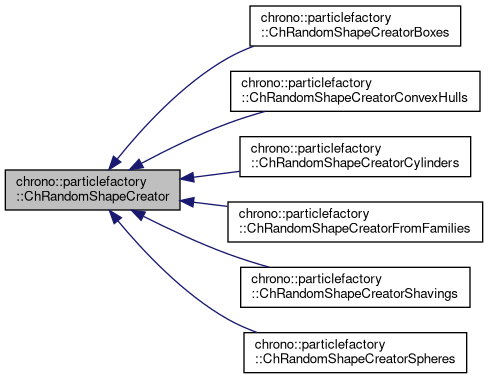 Implemented in chrono::particlefactory::ChRandomShapeCreatorFromFamilies, chrono::particlefactory::ChRandomShapeCreatorShavings, chrono::particlefactory::ChRandomShapeCreatorConvexHulls, chrono::particlefactory::ChRandomShapeCreatorCylinders, chrono::particlefactory::ChRandomShapeCreatorBoxes, and chrono::particlefactory::ChRandomShapeCreatorSpheres. This function does RandomGenerate and also executes the the custom callback, if provided. Usually no need to override. Set if the created particles must include the collision shape(s). Note that this is ON by default. Switching off will turn off the collision. Set if the created particles must include the visualization asset(s). This is ON by default. Switching off might be more memory efficient for very large simulations that are batch-processed only.